~ Guided and/or unguided fishing is available! - Shore fishing on our private 5 acres of waterfront. During the peak red salmon season* the number of our cabin and shore fishing guests is limited to provide the optimum fishing experience without overcrowding. 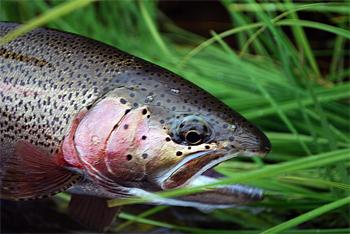 We have over 350 ft of some of the best private riverfront shore fishing available. When contacting us, please let us know if you are interested in shore fishing on our waterfront while staying with us during the peak season. Silver salmon and pink salmon can also be caught from our shoreline during the dates of their runs. King or chinook salmon are so big they really can't often be caught from shore and are best pursued by boat with a guide. See a short video of our sockeye shore fishing at http://www.youtube.com/watch?v=vKOy1tD9QDE . UnGuided Fishing & Lodging Rates can be seen by clicking here. Any of our below samples of guided fishing packages can be customized to your wishes, including the addition or substitution of 1 or more days of fly out fishing and bear viewing or halibut fishing. 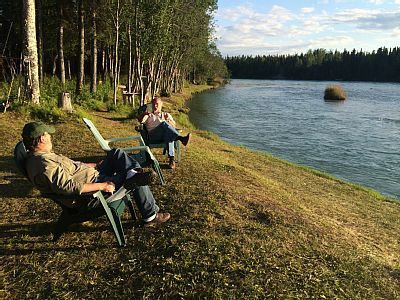 Our Fishing Packages include comfortable lodging on the Kenai River with a full kitchen, direct tv, Wi-Fi and all amenities. All high quality fishing tackle is provided during guided trips. Day trips wth lodging accomodations available. Call us at (907) 242-7245 for booking, questions or details. 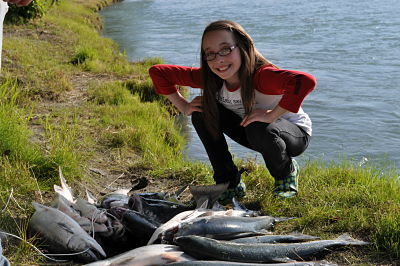 1 free day for sightseeing or unguided bank fishing on our private Kenai River shoreline. 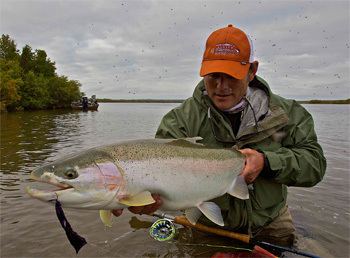 4 Days of guided fishing for Trophy Rainbow Trout / Dolly Varden / Salmon on the Kenai or Kasilof Rivers; including on the water expert fly-fishing and casting instruction by the only FFF certified fly fishing instructors on the river. All the packages are priced per person and are based on double room occupancy. If you will be coming in a party of 2 or 3 we may add other clients to your fishing party. Prices subject to change without notice and should be confirmed before booking. Please let us know how many there will be in your party when contacting us. Sales tax and fees of 3% iare added to package prices. All fishing trips are fully equipped with bait & tackle along with the best equipment available and a very knowledgeable and experienced guide. The only thing you will need is a fishing license, which you can purchase at almost any store or online at "Fishing Licenses". 1 Day of Halibut, Lingcod & Rockfish on the Cook Inlet or Prince William Sound Waters. Reserve your dates ~ Book Now ! for booking or for more information. Advanced reservations are highly recommended to help insure your party's dates. balance due 60 days before your arrival. Master card or Visa welcomed ! © 2019, Alaska Internet Marketing, Inc. All rights reserved.